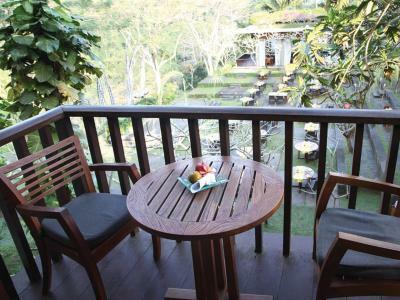 Lock in a great price for Maya Ubud Resort & Spa – rated 9.3 by recent guests! Great Breakfast and F&B offering in general. Staff correct. Location extraordinary. The room was excellent and amazing facilities like morning yoga, afternoon nature walk etc. Our stay exceeded anything I could have hoped for. The staff was more than accommodating, the food was off the charts EXCELLENT! The breakfast array was unlike anything I’ve ever experienced. The spa was something out of a magazine that you could only dream of visiting. I travel a lot and stay at many different hotels, this was luxury at its finest! I liked the private swimming pool, the other pools also. We loved sitting in the open air bar. Service was superb. Everything was extraorinary.. fell in love with the resort, service, lovely staff, cleanliness and the great quality food. the staff were great, they upgraded our room to a deluxe pool villa and it was amazing. Luxury. Clean. Great food, very delicious breakfast. Love the bathroom. Beautiful location. Quite. Love everything about this hotel. The breakfast was excellent. Tried the menu for dinner and quite satisfied with the taste! Beautiful rainforest hotel. Clean. Wonderful rainforest walk. Incredible good view. Close to Ubud center. Beautiful setting in the forest. Spa is amazing and the infitity pools will burn up your Instagram :) Yoga every morning and great spot to just sit back and relax. Maya Ubud Resort & Spa This rating is a reflection of how the property compares to the industry standard when it comes to price, facilities and services available. It's based on a self-evaluation by the property. Use this rating to help choose your stay! One of our top picks in Ubud.Perched in a secluded green valley by the Petanu River, Maya Ubud Resort & Spa offers a tranquil getaway with a natural setting in Ubud. Guests can explore Peliatan rice terraces, indulge in relaxing spa treatments by the river, or enjoy quiet time by the infinity pool. Providing free WiFi in all areas, this resort also houses 4 dining options on site. 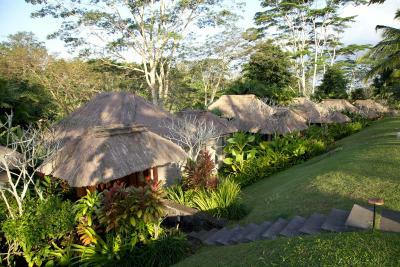 Maya Ubud Resort is less than 1.2 mi from Ubud Market and 18 mi from Ngurah Rai International Airport. A free 2-way shuttle goes to Ubud City Center from the resort. The resort is a 17-minute walk from Elephant Cave, while Yoga Barn Studio is a 20-minute walk away. Blending traditional Balinese décor with modern comforts, air-conditioned rooms and villas at Maya Ubud are equipped with a TV with satellite channels and a mini-bar. Private bathrooms feature bathtub and shower facilities. Maya Sari Mas serves international dishes, while Maya Sari Asiatique features a Asian cuisine. Other dining options include free afternoon tea at Bar Bedulu, as well as salads and snacks at River Cafe. Complimentary afternoon tea is offered at Bar Bedulu between 16:00 and 17:00. At Maya Ubud Resort & Spa guests can work out at the fitness center, play a game of tennis, or join yoga classes at the open-air pavillion. A business center and a bicycle rental service are also offered by the resort. Around the clock assistance is available at the reception, where staff speak English and Indonesian. 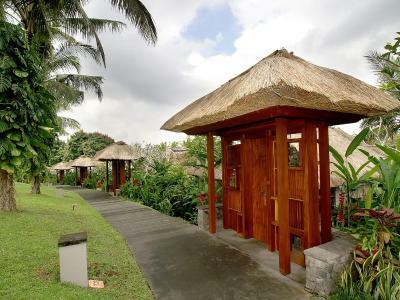 Maya Ubud Resort & Spa is 1.1 mi from Ubud Market and Ubud Palace. Ubud Monkey Forest is 1.3 mi from the property. When would you like to stay at Maya Ubud Resort & Spa? This villa features a patio, electric kettle and mini-bar. This villa has a executive lounge access, dining area and mini-bar. Our goal is to create and maintain the sector benchmark for environmentally responsible style and personal luxury together with inspired service that exceeds guest expectations, with innovative management initiatives and a dedicated staff who take ownership to ensure the ultimate atmosphere for relaxation, refreshment and renewal. House Rules Maya Ubud Resort & Spa takes special requests – add in the next step! Maya Ubud Resort &amp; Spa accepts these cards and reserves the right to temporarily hold an amount prior to arrival. Maya Ubud Resort & Spa accepts these cards and reserves the right to temporarily hold an amount prior to arrival. In the event of Ngurah Rai International Airport closure on guest's planned departure date, the hotel will offer, based on a minimum stay of 3 nights, up to an additional 3 nights accommodations, including breakfast, free of charge. The place is amazing ! Your literally In the middle of the jungle. The staff are so friendly the rooms are big and clean. Highly recommend. It would be if there was a walk from the hotel through the fields to the town. But there wasn’t a fault in the actual property. It is beautiful, simply wonderful. The food served at the bar was average...only mistake. Bed was a little for my personal preference and pillows very thick and plump though too thick for my slim frame. Yoga offered everyday at the resort. Choice of two pools. Beautiful landscape and surrounds. Nothing. But at the last music there was a party across the road at another hotel/hall which had loud music. Private, clean, peaceful and tranquil. That we didn’t have more time there to explore! It rained a bit as we went in early March which can’t be helped but it was still great regardless! It was a beautiful setting and the staff were so friendly and helpful and made sure we were looked after- even after I told them I was gluten free they remembered and whenever I ordered the staff were aware and I didn’t have to ask. The spa and pool area were also lovely. The morning yoga was also great and the instructor gave some interesting background on Balinese tradition when it comes to yoga. Dinner was overpriced and food was not good. Most gorgeous infinity pools I've ever seen. Spa was incredible. Staff was extremely professional and accommodating. Loved the free tai chi and yoga classes.